Killer Characters: Glassblowing on a Cruise Ship? #Bookgiveaway! Glassblowing on a Cruise Ship? #Bookgiveaway! Hi, Savannah here. One of the lovely things about living in Florida is that we are close to many cruise ports. The closest one is in Tampa. 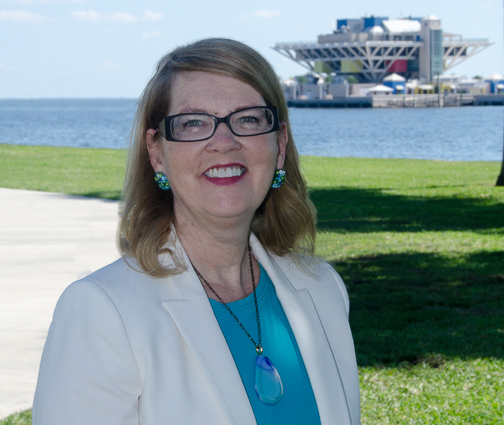 Cruise ships also leave out of Port Canaveral, Fort Lauderdale, and Miami. While I was an apprentice in Seattle, WA, I was sent for training in Corning, NY, to be a glass blower on a class of cruise ships that had a hot shop on the top deck. The training was necessary because cruise ships are not permitted to have an open flame for the creation of their pieces. Instead, electric powered ovens are used for heating the molten glass and curing the finished pieces. Do you like to cruise? There's a #GIVEAWAY! Leave a comment and your email address in the form of yourname(AT)server(DOT)com to avoid the SPAM bots. Do this by midnight on May 25 for the chance to win a signed Advanced Review Copy (ARC) of Shattered at Sea. This giveaway is open to U.S. and Canadian residents only. Winner will be notified within 48 hours after giveaway closes. Etched in Tears releases on August 28, 2018 but is already available for pre-order on Amazon, Nook, Kobo, and in your favorite bookstores. It is published by Kensington Books. You can also ask your library to order it for you. 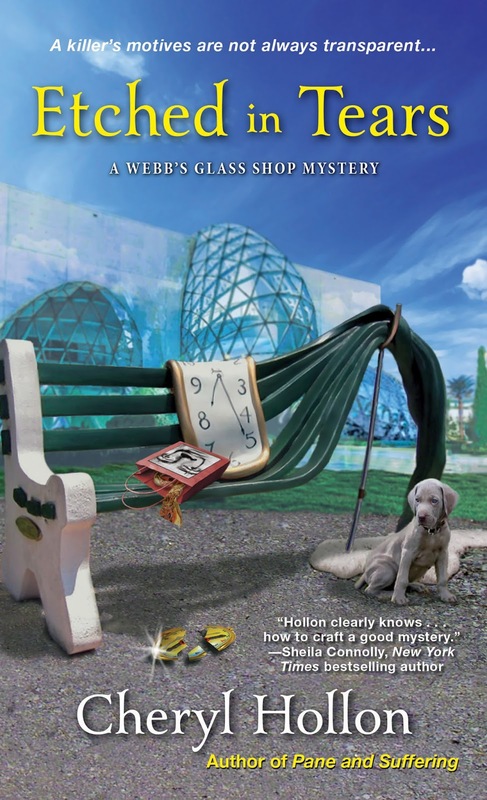 A Mediterranean cruise gives glass shop owner Savannah Webb a chance to demonstrate her expertise--and fire up her skills when it comes to foul play. When Savannah signs on to perform glass blowing on a cruise ship, part of the appeal is that she'll get to meet her boyfriend Edward's family in England. As an added bonus, Edward's cousin, Ian, will be joining them on board. But when Ian disappears at the beginning of the cruise, the ship's authorities initially consider it suicide. Savannah tries to balance her growing suspicions with work on her shows, but her relationship with the other glass artists begins to crack. And she can't let love color her judgment when Edward suddenly jumps to the top of the suspect list. His fate is in Savannah's hands, and she'll do everything she can -- on land and sea -- to clear his name. Cheryl Hollon writes full time after she left an engineering career designing and building military flight simulators in amazing countries such as England, Wales, Australia, Singapore, Taiwan and India. Fulfilling the dream of a lifetime, she combines writing with a passion for creating glass art. In the glass studio behind the house, Cheryl and her husband George design, create, and produce fused glass, stained glass and painted glass artworks. I love to cruise. On a riverboat cruise, a glass blower came on board and did a demo. I still have my little glass pig. Taking a cruise is on my bucket list! Going on a cruise is high on my bucket list. My husband has no desire so I think it will be a girls trip with my mom and daughter...maybe a Disney one before she's too big to enjoy that part. Also, I want it to be tropical! But I'm not picky. haha! Thanks for the chance to win too. The only cruise I've been on was years ago on the Delta Queen on the Mississippi River. It was one of the best vacations I've ever been on, lots of fun. 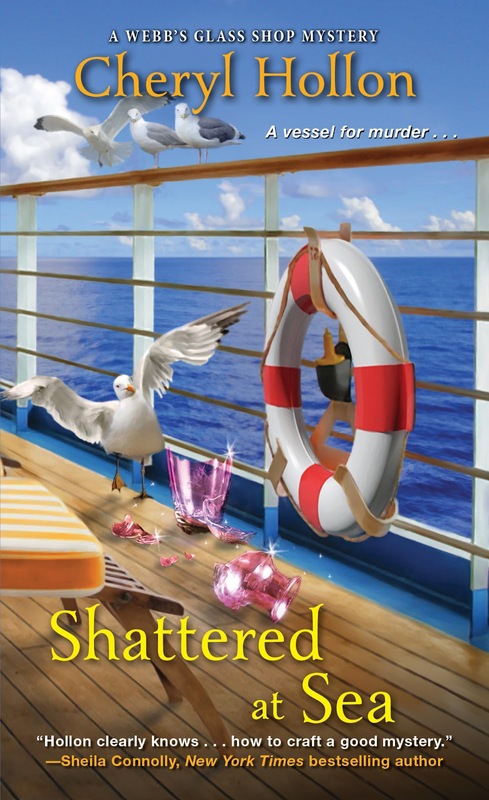 Would really like to read "Shattered at Sea". I have not been on a cruise,but is seems like a great setting. Would love to win, thanks for the chance! I would love to read your new book, Shattered by the Sea. Cruising is my woooosah! We cancelled our vacation this year since I cant be too far from the doctors for now but hopefully in 2yrs we can set sail again! I can't wait to read your book! I have never been fortunate enough to go on a cruise. I does sound like tons of fun and I'd love to give it a whirl some time. "Shattered at Sea" sounds like an amazing cozy. Nothing makes a woman's blood to pumping than to defend her man. Will be interesting to find out how Savannah proves Edward's innocence and how Savannah's glassing blowing plays into it. Thanks for the wonderful chance to win an ARC copy! I know I'd be thrilled to be the very fortunate one selected. I’d love to go on a cruise...always have dreamed of it...I grew up in Southern California. Ring at the sea or on it restores my soul. However, hubby is a life long land lubber who would rather die than go on a cruise...someday...I’ll go with a friend or one of the adult children! My husband and I have tried two cruises. I have never been on a cruise. The book sounds great! My Hubbie and I went on a cruise to Alaska and loved it. We would love to go on another one! Never cruised on a boat or ship. Maybe some day.